Is there a preferred order VHDL case/when and rising/falling_edge statements in processes? What pitfalls are there in putting my rising_edge check within a case/when block? I have VHDL that uses code similar to the first example below and simulates correctly and is synthesizable. However, it is not behaving in accordance with the simulation. Is it better form to write VHDL more like below, with the clock edge driving the case/when? If so, why? 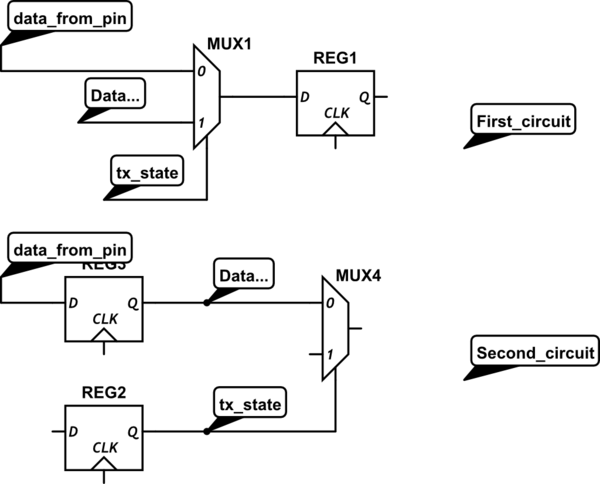 The second, in rising edge of the clock every input evaluated, then feed to a multiplexer. In this case, mux4 has ~1/clock_speed time to evaluate the output. if you implement the first one, for instance, assume you have a "data_from_pin" then the compiler should care about delay(delay between data_from_pin and tx_state and ...), The compiler knows the tx_state pin is asynchronous and may change before clock edges multiple of time, the timing of system should be exactly true. But the second circuit knows every timing of output is based on an old clock and all inputs are stable for evaluation of new state machine. While the first example may be syntactically correct, I have never seen clock logic enclosed within anything other than an IF/ELSE that selects between reset and clock. It is far better from a readability standpoint to have an "if rising_edge" enclosing all of the synchronous logic for the process, so that you can immediately tell that it is indeed synchronous. Also, your sensitivity list only needs to include the clock input, since if it's truly a synchronous system all of the other variables only matter when the clock changes. If the process needs an asynchronous reset, then the reset must also be in the sensitivity list.